I mentioned in my last post that May would be a busy month. We were traveling for most of it and it has taken me a little while to get back into my routine at home. I'm glad that I chose finishing just two blocks as my One Monthly Goal. 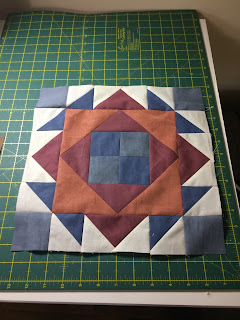 Even with a small goal, I finished just under the wire to be able to link up on Elm Street Quilts. The seam ripper got a lot of use as some of those half-square triangles were turned in the wrong direction. I have no idea how that happens when I have the pattern directly in front of me as I'm pinning the pieces together! I hope everyone had a great month. I look forward to being more productive in June! This will be short and sweet as I've got a lot going on right now. May will be a busy month so I'm keeping my One Monthly Goal simple. I'm planning to complete these two blocks for a Block of the Month quilt. Hopefully, I'll get a little more time in the sewing room this month, but I'm not counting on it. 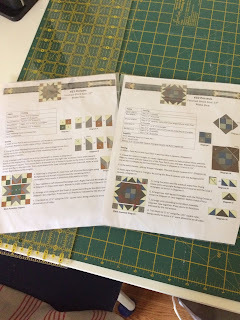 I'm linking up with Elm Street Quilts. Looks there are some great projects waiting to be done this month!